Our home country, The Netherlands, is the thirty-first most densely populated country in the world. The 17,000,000 Dutch men, women and children are concentrated on an area of 41,526 km². So you might think there is nothing to explore ‘off the beaten track’. Well you are wrong, as we stay a weekend at one of the most tranquil places in this tiny country. Just outside the small village of Rockanje, not far from the port city of Rotterdam, we found an old dune farm that until recently doubled as a forester home before it was transformed into a unique and comfortable holiday home for 7 people. The house is managed by Buitenleven Vakanties, an initiative of the three nature organisations in the Netherlands (De Provinciale landschappen, Natuurmonumenten and Staatsbosbeheer). An important reason for them to offer holiday homes is to let people experience nature up close, but also to help maintain some of the special buildings. Their rentals range from special farms to a stately villa, and everything in between. They all have one thing in common; they are all situated in unique places in nature. And we definitely end up in a unique location this time. Our oldest daughter brings her friend Fabienne along this trip and both are immediately excited by the idea of spending a few days near the sea. The adventure starts the moment we drive through Rockanje and head down a small unpaved road leading up to a road barrier locked with a padlock. The setting in the dunes is already beautiful, but as we finally spot our weekend accommodation, we all stand in awe for a while. The house is called ‘Duinen 10’ and somewhat resembles an old white washed English cottage. It was built in the late 1920sand is the last building along a dead-end road. So, no real neighbours apart from deer and the herd of magnificent Highland cows with enormous horns that call this area their home. This breed originates from the Highlands and Outer Hebrides islands of Scotland and their long hair gives the breed its ability to overwinter. Bulls can weigh up to 800 kilograms (1,800 pounds) and cows up to 500 kilograms (1,100 pounds). They are friendly creatures, but make sure not to spook them as otherwise they might run you over. Nevertheless, the girls get a bit closer, but of course we have to keep our distance. After this first encounter we explore the place. It has a pleasant, cosy, and also modern interior. On the ground floor you find a combined dining/sitting room and a separate kitchen (convection oven, separate microwave, dishwasher, fridge-freezer), an en-suite bedroom with a shower. On the first floor there are 3 bedrooms, a separate toilet and bathroom with shower. The home has a large fenced off garden with a large, partly-covered, terrace and a shed. The beds are very comfortable and at night all is dead quiet so we all sleep like babies. One thing we also particularly like is the fact that the house is stoked with all kinds of maps, brochures and books giving us information about things to do, the surrounding nature and history. Surprisingly, there is even a kids’ book about making objects out of twigs and other material to be found in the dunes and bushes. Rockanje is in the Dutch province of South Holland on the island of Voorne (often mentioned together with neighbouring island Putte). The isle is a transition zone between city, sea and land. It connects the urban area of Rotterdam with the rural islands of Zeeland. It is a border between then and now, tradition and future, with a natural border made of water. The holiday house sits on the edge of the acclaimed ‘Voorne's Duin’, one of Western Europe's most important nature reserves, thanks to its outstanding flora and fauna. Since the 13th century, the dunes and their valleys have been inhabited. At first there were mud flats with islets, inlets and gullies behind the dunes. During high tides the isles were flooded and left a sediment of clay until finally the level of the ground had risen high enough by accretion that it didn’t flood anymore. Then the land could be impoldered. The unique biodiversity and the many things to do and see, make this region of The Netherlands a great destination for short breaks or longer stays. The beaches here are known as the cleanest beaches in Europe. And the beach, the forests and the dunes offer a great background for cycling, walking, surfing or horseback riding, to name a few activities. We love the short hike to the beach right through nature. But you will also find historical towns like Brielle and Hellevoetsluis. 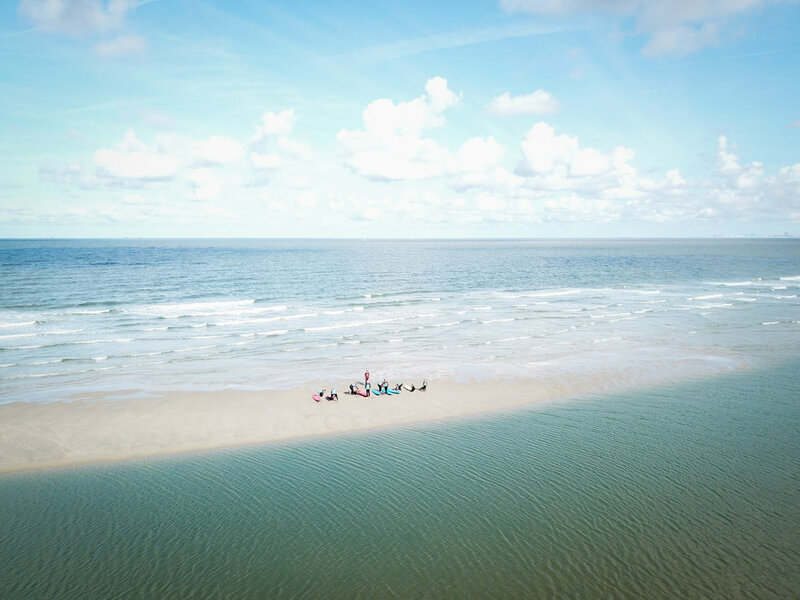 As both the girls are very sporty, one of the activities we undertake is a wave surf lesson at the Surfkaravaan school in Ouddorp, just a short drive from Rockanje. The small waves of the Noordzee are perfect for learning how to surf and under the watchful eye of one of the professional and attentive instructors, they both manage to ride some waves while standing a little on the board. And if you are already an experienced surfer, they rent out all kind of surf gear. The Oostvoornse Meer is a favourite spot for many wind surfers. Surfers can park their cars near the water on the northern shore. There is ample space to gear up their sailboard and there is no need for endless plodding, because the water is nearby. On the southern shore there is also an attractive surfing spot. Beginners can take their first surfing lessons, while more experienced surfers are able to enjoy the full extent of the lake and the excellent conditions. Apart from a surfer’s paradise the Oostvoornse Meer is possibly the nicest spot to scuba dive in the Netherlands, a fact that is also recognised by divers from abroad. Annually, there are about 600,000 recorded dives into the lake. It is even possible to get your diving qualification in the weekends. The average depth of the lake is 20 metres, with some pits as deep as 43 metres. Also close by is the ‘De Duinhuisjes’ open-air museum, near the Tenellaplas Visitors Centre. This lovely museum consists of four original dune farmhouses and their outhouses, dating from 1850 - 1910. You can visit three of these characteristic farmhouses which have been restored to their original state. The houses are decorated in the style of those days, around 1900. If you don’t mind driving, do try Delta Park Neeltje Jans. Children will love the waterpark and all kinds of attractions, including swimming with sharks. But Neeltje Jans is famous around the world for another reason; the Delta Works were built to keep everyone safe and to prevent a recurrence of the 1953 flood disaster. It’s really quite important since more than half of the Netherlands lies below sea level. You can relive history at Deltapark Neeltje Jans: from the flood disaster to the construction of the Delta Works. Back in our ‘home away from home’ we cook the fresh fish, shrimps and mussels we bought at the local fish shop. With a family, it’s nice being able to prepare your own meal, not having to find a suitable restaurant. We lit a small bonfire on the big terrace for the girls to roast marshmallows for dessert. While the dark sets in, we huddle around the wood fire playing games and making jokes. This again proves that happiness, in most cases, is found in the detail. The next day is perhaps the highlight of our visit as we head to the Brouwersdam to witness the release of five seals. They were rescued from the nearby beaches and brought to the ‘A Seal’ rehabilitation station. And after what can be months of care, they are now ready to return to their natural habitat. Well, it appears that we are not the only ones excited and curious to see this event. As we drive to the beach we see literally hundreds of other families stumbling through the sand to get to the release area. We are now sure this is a very special event. It is a magical sight to see these cubby creatures to return to freedom. Although one seal apparently liked its temporarily ‘hotel’ and refuses to leave the safety of the transport case that was used to bring the seals from the sanctuary to the beach. So, to the amusement of the spectators the volunteers decide to take it back again to the station for a future release. After this spectacle we all want to know more about this project so we drive up to the rehabilitation station itself. The place is small, but they have lots of information and interactive bits for children and, of course, seeing the seals is amazing. You get a good impression of their work saving sick and lost seals and pups. These seals start in quarantine and are cared for back to health. It's a slow process but the ultimate achievement is they are rehabilitated and released. Remember, it's not a tourist attraction and the organization probably survives through the relatively high ticket prices. And you can adopt a puppy if you want. A visit will only take you about 1 hour and you can make a day of it as there also is a beautiful cafe/restaurant with relaxing ocean views. Overall it a great place to learn about Dutch wildlife and witness seal rehabilitation in action. 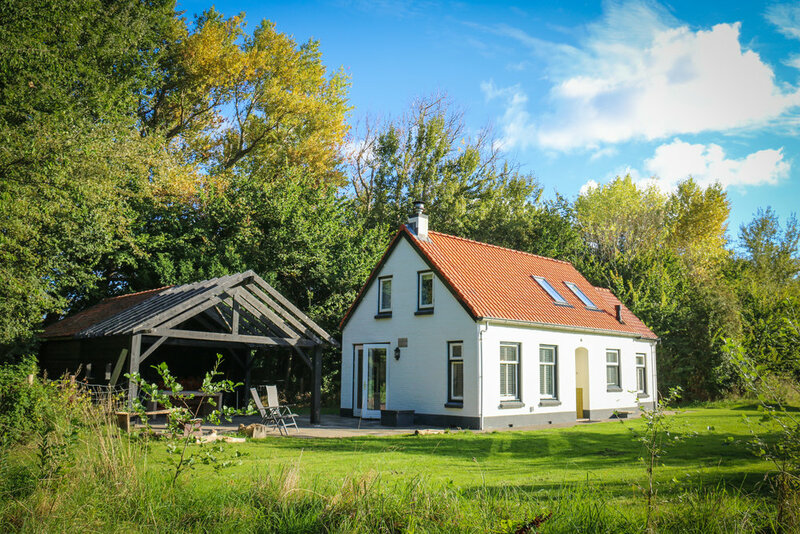 We could have stayed much longer here, not only for the lovely farm in the middle of nature but also because Zeeland has so many beautiful places to offer and, if you are in for adventure, Buitenleven Vakanties makes it easy for you. Lots of suggestion and even an ViP passes (Voorne-PuttenPas) for all family members for an enormous range of activities in the region. # The old dune farm is in the middle of one of the most amazing dune areas in western Europe. Nearby the beach of Voornes Duin (10 minutes’ walk). Peace, space, silence and still only half an hour away from Rotterdam by car. # Beautiful landscapes to hike with wildlife. Several hiking routes clearly marked with numbered signs. Both forest and sand dunes with dune valleys and small lakes. 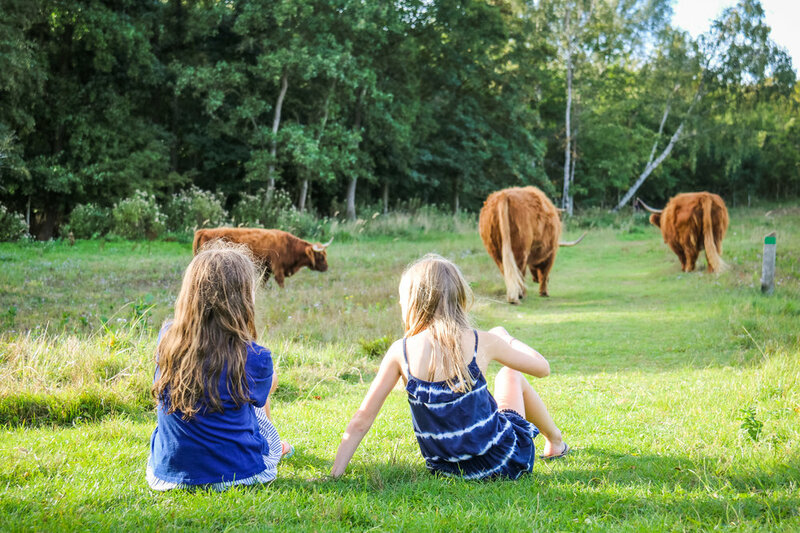 # Buitenleven Vakanties offers a truly incredible range of accommodation, all hidden in nature and many are great for kids. Duinen 10 is one example and promises a lot for the rest.